The art leasing program at Bucks Gallery of Fine Art is a convenient and economical way for clients to build art collections for the home or office. Any single work of art or group of art with a combined value of $500 or over may be leased. Allows businesses to have high quality art without a large capital outlay. Businesses may realize tax advantages by expensing rental payments - even on an appreciating asset! Our services include consultancy in the selection of artworks to fit your budget, framing, delivery, and installation of artworks selected for the lease. 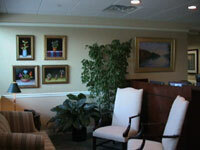 Leased artworks may be exchanged every six months, or at the client's request. Typically, lease payments for artworks located in commercial premises are tax deductible business expenses. The Bucks Gallery of Fine Art offers purchase and lease-to-own options as well. Purchase prices for specific original artworks can be quoted on an individual basis. The first step is to arrange for a consultant to visit your business and work with you to select a range of artworks to lease that suits your requirements. We can then discuss your preferred leasing arrangements, prepare the lease and agree on a time to return to install the artworks. The Bucks Gallery of Fine Art deals with over 50 artists, which enables you to choose from an extensive range of original contemporary art to suit your specific preferences and requirements. To view a sampling of our featured artists in a corporate setting, click here view the Bucks Gallery of Fine Art Corporate Presentation*.